Well, Thanksgiving is over, the turkey is almost gone (almost) the Ishida boys are back at school (albeit grudgingly) and most of us are sick or in recovery. Sounds like a pretty successful holiday weekend to me. We celebrated in traditional style with our take-out turkey dinner – a tradition I started when we first moved to the states about 8 years ago and one I intend to maintain for years to come. It’s just so much more relaxing than standing over a hot stove and then having your children reject the food anyway. This year our good friends spent the day with us which made the whole day a little more festive and fun. The men watched football, the kids watched Totoro (highly recommended) and the women enjoyed a day when everyone was occupied and they could enjoy a few hours of chatting and sipping on hot mulled wine. Perfect. I didn’t take any photographs, mainly because it was dark and dreary and I preferred, this year, to simply relax and enjoy the day rather than deal with the disappointment of trying to catch a few moments on film without a decent shot in the bunch. So, without a thanksgiving photograph to share, I thought a little I Heart Faces challenge photo was in order. This week’s challenge is a tough one – scenic black and white with a person in the photo. A. My photos are 90% colour and, B. I usually choose people OR scenes. It’s rare that I combine the two unless it’s the standard tourist-in-front-of-a-landmark pic. 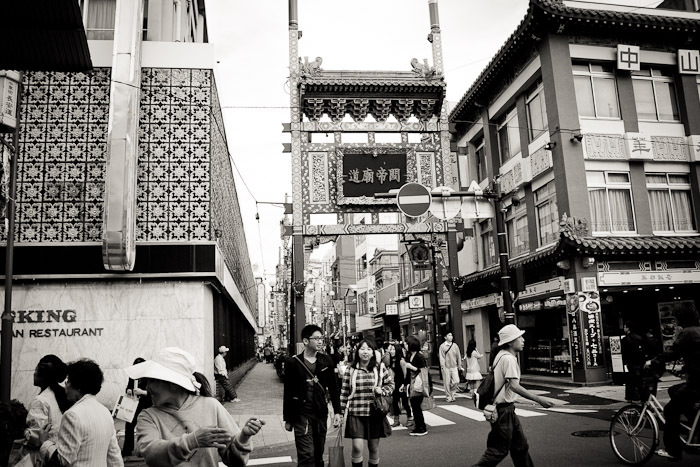 At first I was focused on finding a landscape shot, but ended up settling on this photograph that shares a little of the hustle and bustle of Yokohama’s Chinatown. Frankly, we didn’t see a whole lot of landscape during our recent visit to Japan but I love that I was able to capture a snapshot of time in the city and I feel as though the black and white places more focus on the people than the bold red and gold colors of the street. Now, off to lie down and try to kick this illness so I can finish up my Christmas presents this week. Printing and international shipping deadlines are breathing down my neck. This entry was posted in Challenges, Life, P365, Photography. Bookmark the permalink. A timeless shot, great capture!